No one. I repeat no one should bear the brunt of a working Sunday. Especially those who already get to suffer through a six day working schedule. So yes! Today we went to work. Sunday. Day that the sun does down somewhere and comes out only a Monday. And colored blue. Well this brought forth a series of melodramas at home late evening. Is anyone surprised? And in addition a lot of complaining, tears combined with pulling of hair, throwing of things and what not. There are unfinished chores, those odd hundred words initiated posts in drafts, a guest blog which should have gone live last Tuesday (RIP my memory) and so much in general. So what did we do? We shut down the laptop rather slammed it and walked in the room adjacent to us and cry. Our lungs out. We then walked into another room and got ourselves involved with folding of clothes, did that help? A little. And then we walked into a third room and picked up a book to read. That helped even more. Then post some serious thinking and more procrastination we returned to that hurt laptop and delicately switched it on. When people or friends ask me what is it like to blog? I can never quite put it in words. Is it the adulation from peers and readers alike? Or the sense of doing something beyond the usual that gives a kick? Or the fact that it keeps the hopes of some odd manuscript turning into a published dream down the years? I thought. And it came onto me. No. Blogging is what is life to us. It is unpredictable. It has its fair share of ups and downs. Then there are those moments when some fellow blogger’s words touch you so deep down you suddenly realise someone else explained you better. And then those days on end when you refresh the pageviews stats only to see there is hardly any change. The disappointment. And then suddenly a few clicks from some fellow angel and bright sunshine returns. Blogging teaches you so much about life. It tells you that honest relationships survive all times- bad page views, no comments and more importantly the no creativity days. Like life you will find those who only give when you give them instead. Well take on some and see how that goes. Haven’t you been doing that else where as well? All bad nights can be upturned by a good writing day. I guess there are five hundred and I couldn’t really point any one here. So tell us if you blog why do you? And if you don’t…. well then why the hell don’t you!!! Also I am co-hosting Write Tribe’s #MondayMusings this week! Join Corinne and me by writing a #MondayMusings post on your blog. Just share your thoughts with us – happy, sad, philosophical, ‘silly’ even. 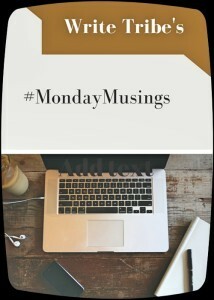 Use the hashtag #MondayMusings and then add your link here or on the Write Tribe post. We would love to read your thoughts. Blogging really is like life! It’s also what makes our life more exciting – the need to express, the desire to be read and the instant satisfaction when someone ‘gets’ what we’re saying! Why do I blog? Hmm..You know sometimes I come up with no answer to that question..Many (especially those who don’t understand the need to blog) would say it’s pointless, but even if that be true blogging forms a part of me…Somehow, not writing a post, or not publishing a post for days, no new comments etc..all of these affect me…I think because blogging is a part of me, an extension of me…I cannot think of me and my blog as separate entities..It’s silly because it only been a few years since I have started blogging and I don’t know what the future holds but for now, I cannot imagine a life where I don’t blog! And yes blogging is really like life ! I agree with you, no blogging creates a void in our lives that we can never explain. Something that runs parallel with our existence … and in a way harms our peace of mind just by not being there… no? Richa, loved your honest reflections on the art of blogging…and I definitely think it is a bit like life itself! And, yet, blogging is a little more than just that…considering how we rummage through tons of thoughts and come up with only a specific few that seem to sum up how we think or feel at any given time, adding in our creative streaks. What comes out as a finished product aptly reflects who we are and I think we should enjoy the process as much as the comments and adulation that we hope to find later. I discover myself anew when I write and that is what I love about blogging. Discovering is all about us bloggers no? Through our words and else where. Rummaging our own thoughts is a task anyways.. Many reasons why I blog & also reasons why I can’t. Not-blogging or not having the time to blog feels like a punishment! Just made me realise how much some people would do for other people. I mean being so busy, they not only concentrate on their blog but encourage other people to go after their passion and help without expectations, hold sessions for people so that they improve. A big thank you for making me realise my passion and bringing me out of procrastination phase.